Life brings complexity and struggle, and yet we have the opportunity to choose peace in every moment, rather than to grudgingly endure whatever comes our way. Some days may be easier than others, but peace can be achieved in every situation. We can survive, even joyfully so, if we have faith in God’s purpose for our lives. The plan for our lives is much bigger than any problem we face. Character and strength are developed in the moments when we feel as if we can’t lose any else. Keep going: put one foot in front of the other. The struggle isn’t the end. 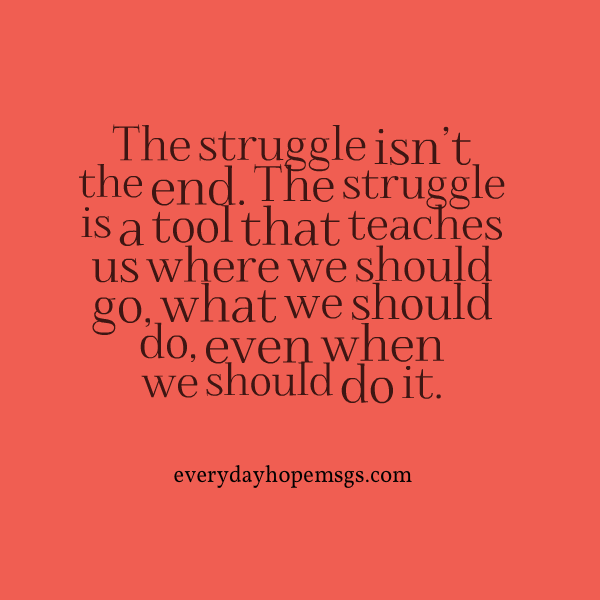 The struggle is a tool that teaches us where we should go, what we should do, even when we should do it. In each moment we seek out God to be our protector, our refuge, our safety, we grow stronger, we feel more peace in our lives. Your road has been long, but you are equipped with the tools to survive and thrive. Instead of simply enduring, choose to be untouched by trouble and find your place of peace.